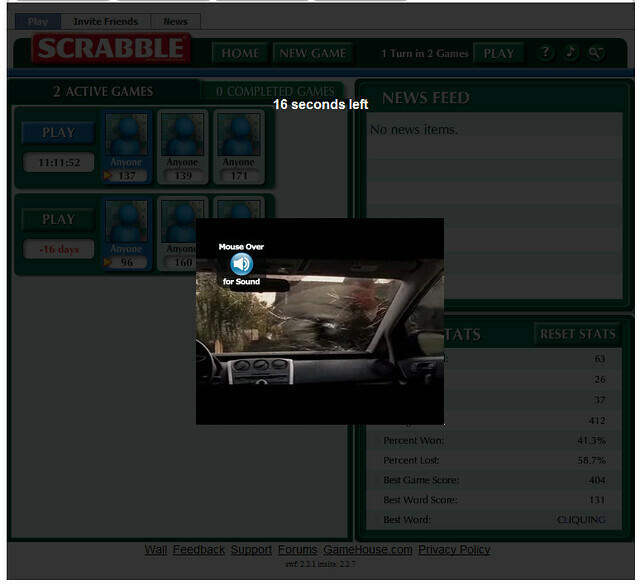 This new advert appears when opening up Facebook Scrabble (the international version). Apparently we weren’t paying the adverts enough attention, now they want to shove it in our faces. Way to piss off your users. Looks like I can stop recommending Scrabble on Facebook to people. This entry was posted in Advertising, Facebook and tagged Advertising, Facebook, Scrabble on Tue 2010-06-29 by daniel. Just add a replacement function for UpdateTime() that includes HideOverlay(), or just place HideOverlay() so it executes immediately after loading the page. Problem solved. I have been using facebook scrabble for a couple of months and then yesterday I got this video advert despite the fact I have pop ups blocked and, just like you said, after it cleared all players were anonymous, every time I open it it does it, during a game when I went to another tab and went back, there it was again and I lost the game because I timed out. I am unistalling scrabble despite the fact I love playing it because I find it so frustrating. Why does facebook allow these irritants? theres an app that allows you to block all flash. you click on the flash that you wish to run, and only that module runs. also stops annoying autoplay videos on the age website. best safari app i ever downloaded. Apart from blocking Flash and letting the selected module through, another suggestion was a custom hosts file. I’m not clear on whether either would work, since it appears the advert is Flash embedded within the Flash app running the game.